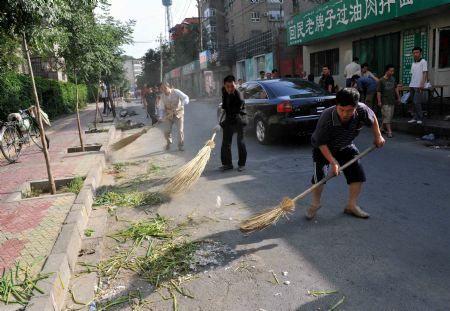 URUMQI: Urumqi appeared to be calm under heavy paramilitary police presence Wednesday after an overnight traffic curfew, but sporadic standoffs and clashes were still reported. The capital city of Xinjiang region in northwest China adopted a "comprehensive traffic control" from 9:00 p.m. Tuesday to 8:00 a.m. Wednesday to avoid further chaos amid the ongoing unrest. Traffic restrictions were still imposed in some major streets as of Wednesday, with members of the Armed Police guarding or patrolling. Armored personnel carriers stood by, but more people appeared in the streets Wednesday than Tuesday. Most of the bus services had resumed as of Wednesday noon. The number of buses running in the streets was 90 percent of that in the normal period, said Urumqi mayor Jerla Isamudinhe at a press conference Wednesday afternoon. Urumqi has about 1,000 buses in total, among which 190 were damaged or torched in the riot that began Sunday night, in which 156 people died, and 1,080 were injured. An overwhelmingly majority of the suspects had been arrested and were being probed, said Li Zhi, Communist Party chief of Urumqi. Those who committed crimes will be seriously punished no matter what ethnic groups they belong to, he said. "The government has the ability to control the situation." "For those who had conducted beating, smashing, looting and arson and continue to go onto streets to breach social order, we will severely punish them according to law," Li said. Jerla Isamudin said supplies of water and electricity were normal. A total of 43 gas stations have resumed services while the other 10 damaged in the riot or in controlled areas were yet to be operated. The Urumqi government transported vegetables in 25 railway wagons from neighboring cities and counties Tuesday for the supply to the city of 3.5 million people, the mayor said. The vegetables have been sent to supermarkets and major bazaars. More restaurants were resuming businesses. Shops in the city's hospitals also increased supplies to meet the needs of the patients, he said. But shortage still remained. At a roadside morning market where 50 members of the Armed Police were patrolling, at least one-third of the stalls were empty. Prices of the vegetables were generally two to three times higher than before. A kilogram of haricot beans, previously two yuan, was sold at six yuan, while potatoes, originally 1.5 yuan, soared to 3.5 yuan per kilogram. Officials said the supply of vegetables was expected to reach 800 tonnes Thursday morning and the price would gradually drop to the normal level. After the riot, some tourists choose to leave the city. Li Qian holding her seven-year-old son hurried to catch a flight. She flew to Xinjiang for tourism but cancelled her plan to go to the Tianchi Lake about 110 kilometers from Urumqi. Li said she just wanted to go back home. She had planned to stay at the airport from Tuesday evening but couldn't reach it because of the curfew. On Wednesday, she took the shuttle bus to the airport -- there were just a few taxis on the streets. Those who are not able to get a handy ticket have gone to nearby hotels. "We fear Xinjiang is not safe anymore," said a passenger, who refused to be named. Nearly all the hotels next to the airport were full. A Xinhua reporter learnt that as they were 17 kilometers away from the downtown area, people normally did not want to stay in those hotels. Only half of the rooms were occupied before the riot. Some office workers in Urumqi were given a day off Wednesday. Su Can, 27, works in an airlines company. She and her colleagues took turns to stay at home. "I don't want to go out and my friends said that we could just make phone calls to each other." Li Gang, a local resident, said his company gave workers a day off and asked them not to leave their houses. "I know from the news report that many rioters were arrested," he said. "Now that the streets are guarded and helicopters are hovering, I think the social order could be restored." No matter Han or Uygur, people are worried that the riot would leave a rift between them. Azgul works in a hotel and has many Han friends. After the riot, some of her friends called to tell her to stay indoor and be careful. "I was touched," she said. But in another sense, she felt that her living condition was changed and she was unsure whether her friendship could last. The 27-year-old girl is preparing for her wedding. "Can my Han friends attend my wedding ceremony?" she frowned. Dong Qiang who works at a local website was born in Xinjiang. "For a long time I felt that different ethnic groups coexist in harmony and I like the place very much," he said. On Sunday evening he was in the office, overlooking the Donghuan market where much of the violence erupted. "If I were there, I might have been dead," he said. The man in his 40s had a child, and he believed that he had taken root in Xinjiang. "The riot could deal a heavy blow to the local economy," he said. But what he cared about more was "could we go back to what we were before? If the answer is yes, then how long should we wait?"